On the 14th, 15th and 18th of April 2016, the Milos Mining Museum organized trekking walks of Miloterranean routes for the pupils of the Adamas primary school, and the high schools of Milos and Folegandros within the framework of their visit to Milos. 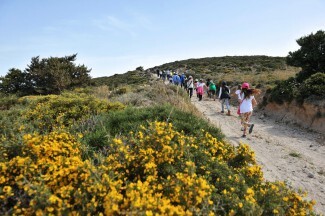 On the 14th and 15th of April, 44 primary school pupils and 92 high school students respectively along with their teachers walked the 2nd Miloterranean route – “Volcano” guided by geologist Alekos Petrakis. They admired the geologic formations and, having crossed the Fyriplaka crater, they reached Kalamos where they toured the area of the natural vents (fumaroles). The forester George Petrakis informed the children about the island’s unique natural environment making special “stops” in relevant sites of particular interest, such as Kedrolivado (cedar meadow) with the centenarian cedar trees. Finally, the Folegandros high school visit of Milos island on April, 18 included a visit to the Milos Mining Museum and a trekking walk of the 4th Miloterranean Route – “Aggeria”. The almost spring-like weather helped the children who walked the 3,5-hours-duration Miloterranean routes.